Attention New England fans: ComiCONN comes to Foxwoods Resort Casino June 30 & July 1 – AiPT! ComiCONN is coming to Foxwoods Resort Casino June 30 and July 1, and AiPT! will be there! If you’ve ever been to a comic convention, you’re aware of just how much money you can blow on everything from highly desired back issues to original artwork. Well, if you’ve ever wanted to attend a con and have a chance at winning back all the money you spend on cool collectibles, then ComiCONN may be the event for you! 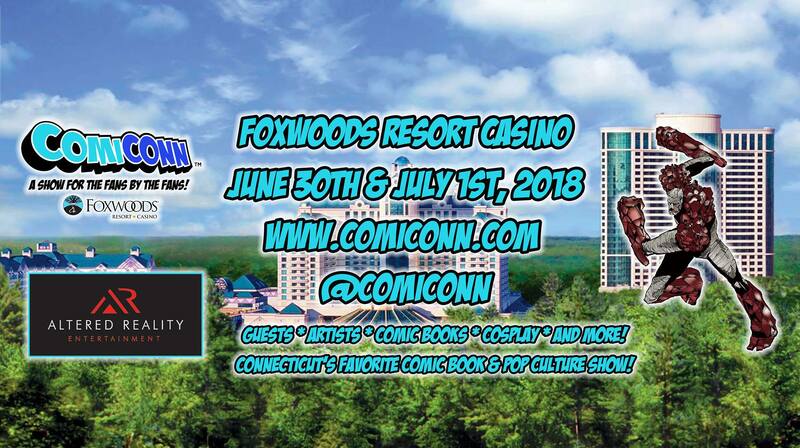 That’s right, this isn’t your usual convention center experience–Connecticut’s ComiCONN will be held at Foxwoods Resort Casino. This show for the fans by the fans will run from June 30 through July 1 and promises to connect celebrities, comic talent and exhibitors with the fans that adore them. Some of this year’s big guests include Freddy Krueger himself, Robert Englund, Jason Vorhees actor Kane Hodder, Buffy the Vampire Slayer’s Julie Benz, and The Walking Dead’s Ross Marquand, who’s currently appearing as one of Marvel’s most iconic villains in a little movie called Avengers: Infinity War. But you can’t have a comic convention without the writers and artists who have helped define the art form, and at ComiCONN you’ll have a chance to meet the likes of Iron Man’s Bob Layton, 30 Days of Night’s Ben Templesmith, Avengers Academy’s Mike McKone and many other creators. In addition to cosplayers, as well as vehicle and props displays, you can try your luck at Star Wars trivia, have your creative portfolio reviewed or look for love in Geek Speed Dating. And remember, once you’re finished with ComiCONN, the fun at Foxwoods Resort Casino doesn’t have to end, as the attraction has more to offer than just gambling–there are retail shops, restaurants, shows and more! AiPT! is very excited to attend ComiCONN and we hope to see you there! To purchase tickets or just learn much more about ComiCONN, head over to the event’s website.